D.C.: What this place needs is an excitement enema. We’re going to make this place fast and loose. Every ride, every attraction, no rules, no speed limits, just pure fun! Action Point Employee: That sounds kind of dangerous. It was an entirely different game back in the ’70s and Action Point Amusement park was the place to be, that is until D.C’s daughter comes to visit around the same time that another mega amusement park challenges it, the out of control Calico Park. Now it’s up to D.C to come up with something ‘great’ to compete against it. The Paramount film stars Jackass leader Johnny Knoxville in the same basic role as a man who has little care other than just to have a good time without any consequences, and for the most part the film follows the same structure as its predecessors. There’s one exception though, Knoxville realizing that he must grow up as he rekindles the memories of his teenage daughter in a story to his granddaughter. There is a slight sophistication around this film that I found admiring. Honestly, I have not been drawn to the other films of the same stature, but this one, I feel, has a slightly better storyline not typical for Knoxville. Similarly, I’d like to bring up the appeal of the story as being told to his granddaughter as a time when he was slightly more out of control. In this way, I think Knoxville and the director took an idea from another film, The Princess Bride, where the grandfather is telling the grandson a story. The only difference is that this is supposed to be real. Other than that, it’s almost the same thing exactly where to granddaughter is stuck inside because she has a cast on her leg and Knoxville (as papa) is trying to make her feel better by telling a story about her mother when she visited the amusement park. It’s an interesting concept that I, myself, wonder if anyone else might have picked up on this or if Knoxville even realized the similarities to the other film. Still hilarious, I did find myself laughing after every single joke, while also going “ouch” when he made a fool out of other’s injuries. Additionally, the film stars Eleanor Worthington-Cox, who made her debut as the eight year old Aurora in the Disney film Maleficient. This time, we see her as a teen awkwardly coming to spend the summer with her father who is so busy with his amusement park, he doesn’t realize his daughter is fading out of his life. In this film, it’s refreshing to see Cox as more of a prevalent character who can handle some dumb comedy while trying to adapt to her adolescent companions. The chemistry between Knoxville and Cox meshes well as we now are looking at Knoxville in an all new light, in the role of father. Subsequently, Action Point is loosely based on a real life amusement park found in Vernon, New Jersey. The director, Tim Kirkby, in collaboration with Knoxville, paid great attention to detail, though they changed the location of their amusement park to being placed Calico City, California. The rides that were shown could have been the actual park that is still in existence to this day, but under a different name. Similarly, the park is still the dangerous type as it was known for when it originally opened back in 1976 when it was accused of injuring park guests. That was more than likely the appeal to Knoxville to base his next movie on the nature of the park. It fits in with his other movies in that way. Of course in true Jackass tradition, the language and fowl behavior was still prevalent to the film, which would not be suitable for children. The message of fatherhood was there, though, and for that reason would make a great movie for the upcoming father’s day weekend. 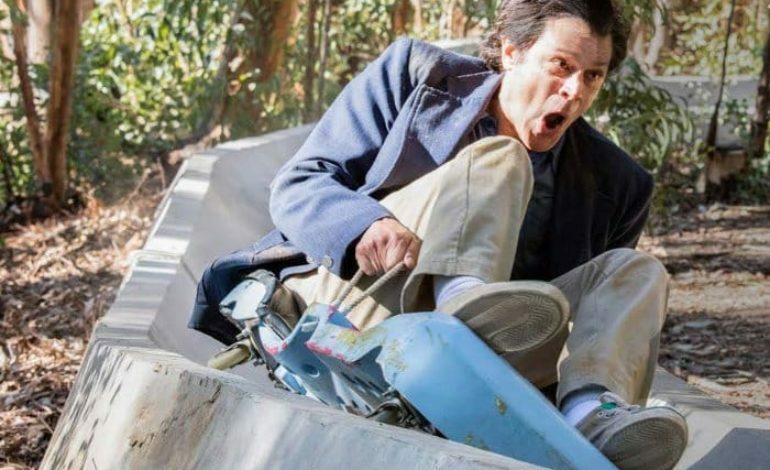 Action Point is much more enjoyable than Knoxville’s previous films. The storyline is stronger and doesn’t rely on rude humor to have a good time. Those that go to this movie expecting that solely might walk away somewhat disappointed, but I for one was relieved and encouraged to keep an eye on other movies that Knoxville will be making from now on.